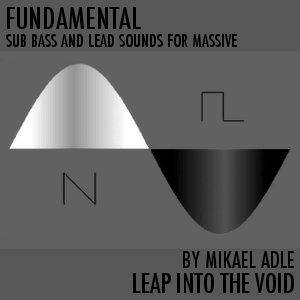 Fundamental is a collection of 95 sub bass, bass and lead sounds. It is a hybrid collection blending ultra deep electronica subs, fat bass sounds, dirty leads with expressive synth sounds inspired by artists such as Joe Zawinul, Jan Hammer, Herbie Hancock, colored just enough to give it a certain amount of a Leap Into The Void. You’ll find fundamental frequency basses, analog basses, wobble basses, kick basses, mellow sub basses, aggressive basses, noisy basses, expressive leads sounds, classic poly leads, mono leads and more. It’s an organic collection of sounds with focus on enabling direct expressiveness and character via velocity controlled envelope attack, velocity controlled filter cutoff etc. aswell as mod wheel assignments for further expression and coloring. Each of the eight macro knobs are of course assigned. Suited for any type of electronica, IDM, EDM, drum & bass, pop, rock, hip hop, fusion, and all situations where you need fundamental tools delivered with a touch of Leap Into The Void. • 95 sub bass, bass and lead sounds. • Highly expressive via velocity and mod wheel assignments (mod wheel, macro knob 1). • Detailed patch list PDF with descriptions of the sound and macro assignments. Descriptions are also included in Massives attributes. Note: All sounds heard in the demo come from Fundamental.